I’ve recently taken on a new-found interest in visiting Washington’s dog friendly Ghost Towns with Moo. The abandoned buildings found in ghost towns tell the story of a different time and a different way of life, and I find myself drawn to exploring these neglected, and often times eerie, historical sites. Ghost towns allow you to take a walk through the past; an exciting way to spend any day for those who enjoy history. In addition to this, many ghost towns welcome dogs on their premises, which is a huge added bonus. So, I’ve made it a priority to visit some of these deserted towns over the next couple of months. 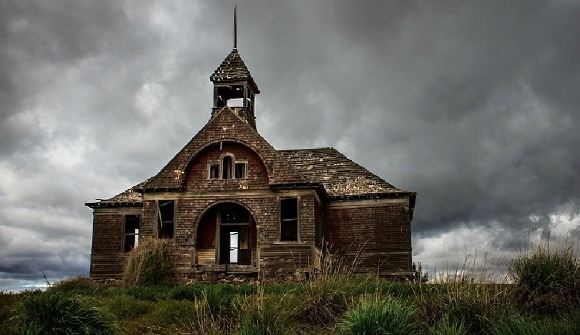 Washington has close to one hundred ghost towns, some of them being full buildings that still remain standing, and others merely consisting of mines or moss covered bricks and stones that faintly show the traces of a town that once was. As with any ghost town, it’s often the history that makes the destination so fascinating. While the buildings themselves can illicit feelings of both wonderment and wariness, it’s the story behind the abandoned towns that bring them to life. 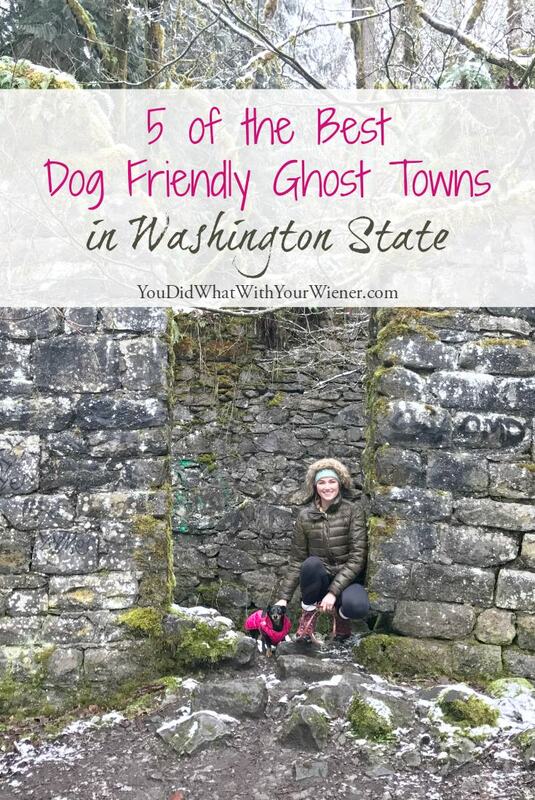 Below are five of Washington’s dog friendly Ghost Towns that are top on my list to visit. They’re all within a 6-hour drive of Seattle. The closer ones could easily be done in a day. While the ones furthest from Seattle COULD be one in one really long day, the visit might be more fun if it’s incorporated into an overnight getaway. Melmont Ghost Town is hidden away in the foothills of Pierce County, a little over 1 hour from Seattle and three miles from the town of Carbonado. Melmont was established in 1900 as a mining town by a subsidiary of the Northern Pacific Railway, and for roughly 18 years it was a prosperous community that supplied nearly 4% of Pierce County’s coal supply. When the railroad switched from steam to diesel and electric model locomotives, however, the need for Melmont’s coal subsided, leading the town to be abandoned, and many of the buildings to be lost to a fire a few years later. The forest road to get to the trailhead is one for the books—a typical Washington beauty, consisting of a winding road framed by old-growth forest and romantic farm properties with horses. Moo and I decided to start our ghost town explorations last week with this location, due to its close proximity to Seattle/Tacoma. The day I ventured to Melmont ended up being a pretty heavy snow day, which made for some awesome driving views, but also, in turn, made for some unfavorable trail conditions. I should warn you: the trailhead to Melmont is a little hairy. It is tucked away directly next to Carbonado’s Fairfax Bridge (a beautiful steel-lattice arch bridge that strattles the Carbon River), and is incredibly easy to miss. There are no signs to direct you there or signify you’ve arrived, and I ended up driving nearly three miles too far before I stopped at a ranger station to ask for directions. The trailhead is not marked nor well defined within the brush, and starts as a precipitous hill leading you nearly under the bridge. This was the only part of the trail that was difficult—it was muddy and slippery, with large rocks that created steep steps. Luckily there is a metal wire with hand grips to hold on to on your way down. For the most part Moo had no trouble getting down, but there were a few rocks that were too high for her to jump off of, and I ended up needing to give her a helping hand a couple of times (which can be difficult when you’re holding on the hand grip, trying not to slip yourself). I’d say this is muddiest “hike” I’ve ever had the privilege of taking on, which resulted in two hiking boots and one Dachshund that were caked in mud. Moo didn’t seem to mind the mess too much, but by the end of the hike, after being tummy deep in certain puddles, she was shivering and ready to call it a day. These conditions are consistent throughout most of the seasons but notably worse in the winter, so those interested in visiting Melmont, I would recommend saving it until summertime or fall, for both you and your dog’s sake. From there, the trail is smooth sailing. In regards to the Melmont ruins, I’ll be honest in saying there wasn’t much to see, but in a way, that’s part of what makes it so fascinating. 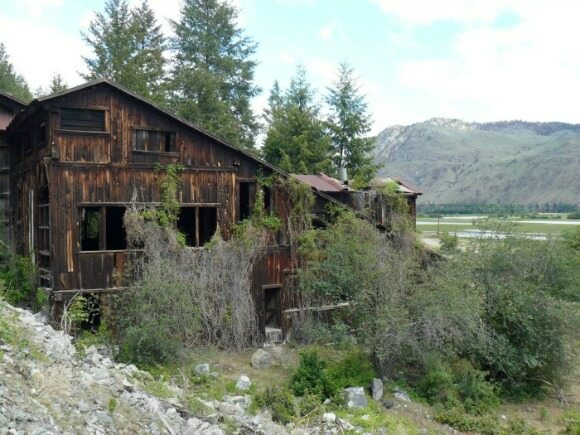 The remaining buildings included an old dynamite shack, the basement walls of a school building, an old bridge abutment, the Melmont coal mine and an abandoned car. There is something awe- inspiring about man made creations that are nearly lost over time to nature’s growth, and being in the presence of these 100 year old architectural clues left room for the imagination to wonder what the bustling and prosperous town of Melmont was once like. If you’re interested in visiting Melmont Ghost Town, click HERE for driving directions. Sherman is a ghost town located in Lincoln County, approximately 4.5 hours from Seattle and 10 miles northeast of Wilbur. It was built around the large agricultural boom that started in 1880, and the town thrived on wheat production for a short amount of time until the 1900s. With the rising prices of wheat, however, as well as quickly developing roads and cars that provided access to bigger towns, the residents of Sherman slowly left the town behind. 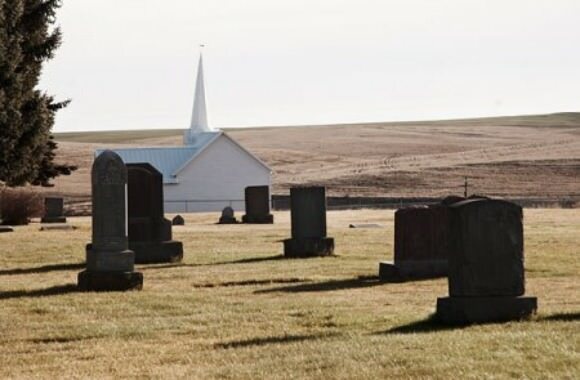 Today, an old schoolhouse, church and cemetery remain to tell the story of this abandoned town, and the lives of the people who once lived there. The stark white church, in particular, is a view that shouldn’t be missed, as it stands in excellent condition amongst the golden rolling hills of Eastern Washington. Sherman is located in the unforgettable foothills of Washington, with miles and miles of farmland as far as the eye can see, and offers the peaceful feeling that comes with absolute seclusion from today’s busy “modern world”. Dogs are allowed to join this adventure, just make sure to always clean up any traces that you or your pup may leave behind, so that this ghost town can maintain its aesthetic appeal, sunken houses and all. Check out this article for some stunning photos of what to expect at Sherman, as well as to read about the life of one of Sherman’s own residents in the late 1800’s. If you’re interested in visiting Sherman Ghost Town, click HERE for driving directions. 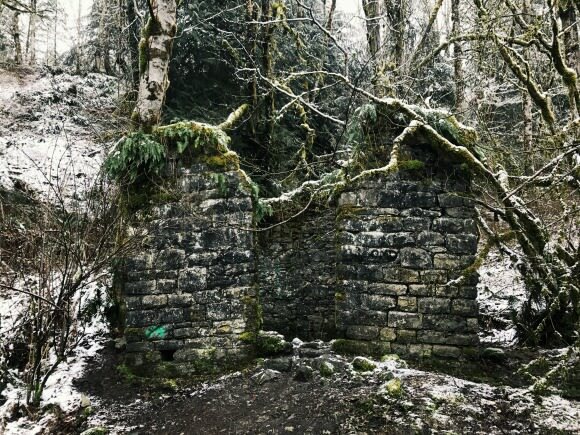 Govan is a ghost town located in Lincoln County, just a little over 4 hours from Seattle. Although there’s not much to see aside from a deteriorating (yet still grand, in its own respect) schoolhouse a few partially standing buildings that are nearly hidden by overgrown vegetation, it’s the rich and haunting history of this town that makes it a worthwhile visit. Govan was established as a railway station in 1889, however it was the discovery of a large sandbank that was used for the construction of the railroad that made it a prosperous town. By 1898 the town had a population of 76 people. What makes Govan a genuinely eerie ghost town are the stories of its unsolved murders. Known to be the most brutal crime ever committed in the county, Judge J.A. Lewis and his wife were found murdered in their own home by an axe in 1902, with robbery believed to be the motive. The killer was never identified, and the murder still remains a mystery. Less than one year later, a second murder was committed by a masked gunman in the town’s saloon; a murder that also went unsolved, making Govan a truly haunting ghost town. If you’re interested in visiting Govan Ghost Town, click HERE for driving directions. Molson ghost town is located in the Okanogan Highlands, about 5.5 hours from Seattle, and was established in 1900 with the hopes of being a successful mining town. Workers struggled to get buildings up as fast as they could as people flocked to the area, increasing the population to 300 in a matter of months. Molson was considered a main hub of the surrounding area, as it had one of the nicest hotels, a dance hall, general stores, a doctor, a newspaper and a drug store. The glory days of this old town were short lived however, and when it became apparent that mining would be a flop, the population dropped to just 13 people by 1901. The town began to boom again one last time in 1905 when it was announced that the railroad would be coming through Molson. Sadly, a local by the name of J.H. McDonald filed for a homestead that included most of the land surrounding Molson, leaving residents with no titles, and thus forced to move a half mile out and establish the town “New Molson”, which can also be visited. Molson is a ghost town that still stands and is in relatively good shape, giving the illusion of stepping back in time a hundred years to the age of the pioneers. 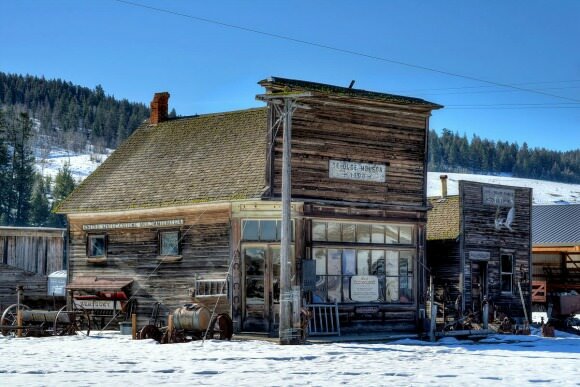 Things you can expect to see at Old Molson Ghost Town include mining and ranching machinery, old town buildings that include a bank, saloon, law office and others, and an old depository of cars. Just a mile or so down the road, there is an old schoolhouse museum, which holds old artifacts and relics, and offers tea, coffee and bathrooms. Three great things to be noted about Molson: it’s free, it’s is rarely crowded as it is very much off the beaten path, and it’s dog friendly! Dogs aren’t allowed inside of the schoolhouse, but if your primary interest is to roam the grounds of Old Molson, your four legged companion is more than welcome to join you. In regards to the best time to visit, I called the museum to get their opinion, and they highly recommend waiting for warmer months. Even now, in March, there’s over a foot of snow at Molson, which I was informed doesn’t make the best touring experience, and probably wouldn’t be the best conditions for Moo either. If you’re interested in visiting Molson Ghost town, click HERE for driving directions. Also located in Okanogan County, not far from the Molson ghost town, the Nighthawk Ghost Town has a similar story as many abandoned Washington towns from the late 1800s: it began as a mining town with an influx of workers hoping to find success in the mines, but ultimately ended up abandoned once operating costs, as well as a decrease in metal value, robbed the town of its economic stability and led it to become a nearly vanished boomtown. Aside from being a mining town, Nighthawk was also a supply center for other mining towns, making it a main hub with a hotel, a schoolhouse, a mining office and an old mill. Most of these buildings are still standing and in relatively good condition, dating back to 1903. Nighthawk is dog-friendly; just make sure you’re always keeping your pup on a leash. This goes for any public outing you and your dog go on, but please exercise extra caution in these areas. Abandoned buildings and deserted mines are great for viewing, but many of the structures are often times rickety and unstable, and are thus not the right place to let your dog roam, for their own safety, as well as for the preservation of the buildings. If you’re living in Western Washington and wanting to visit Nighthawk or other ghost towns in the Eastern Washington area, but your dog doesn’t like long car rides, check out my previous post about canine car sickness and anxiety. If you’re interested in visiting Nighthawk Ghost Town, click HERE for driving directions. With Melmont under our belts, Moo and I look forward to continuing our exploration of Washington’s many ghost towns. Have you visited any ghost towns in Washington State with your dog? If so, tell us about it in the comments. Also, feel free to add your own tips or suggestions for visiting! Calico Ghost Town in Southern CA allows dogs. We took our dachshund and chihuahua. We were even allowed to bring them in the old gold mine. It’s very commercialized, but dog friendly and a heck of a lot of fun.